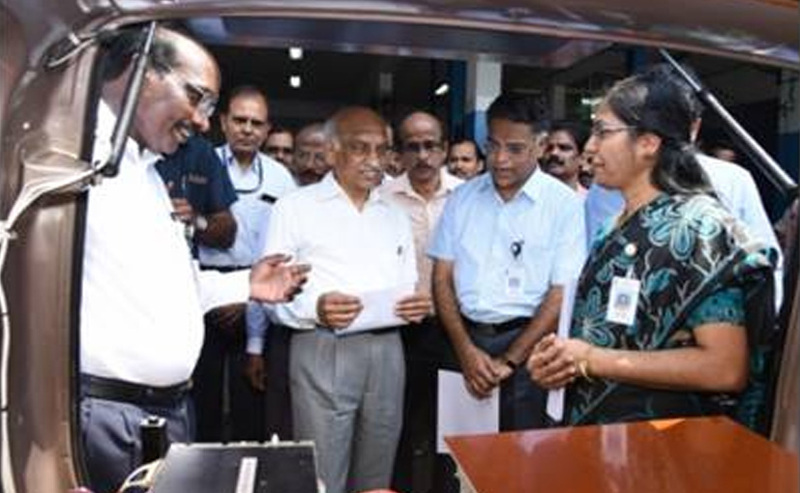 The Scientists of Vikram Sarabhai Space Centre (VSSC), ISRO, Thiruvananthapuram, demonstrated the running of a solar hybrid electric car using in-house expertise and resources within ISRO. They have literally converted a Petrol Maruti Suzuki Omni van to a hybrid electric car and had a successful test run within the campus. The technologies that went into the vehicle were all developed in-house. These include the battery, Super-capacitor, Solar panel, control electronics for battery charging, drive electronics between energy source & an electric motor and power transmission from the motor to wheel through the gear set. ISRO placed a high-efficiency solar panel on the roof of the car and used a super-capacitor to meet the high peak current of beyond 100 Amp. The solar panel charges the batteries that drive a modified lightweight brushless electric motor that sits in place of the petrol engine. Scientists at VSSC Trivandrum Builds Low-Cost Human Heart Pump Using Rocket Technology! VSSC Trivandrum Creates Revolutionary Material That Can Protect Buildings and Automobiles From Fire! VSSC Trivandrum Makes World’s Lightest Material That Will Keep Our Soldiers Warm In Siachen Snow! Here’s How VSSC Trivandrum Made India’s 1st Reusable Space Shuttle! These fresh developments by ISRO come at a time when most leading automakers in India have been working on introducing a hybrid version. This research data might prove beneficial for automakers as the government has already been incentivizing electric vehicles in the country.